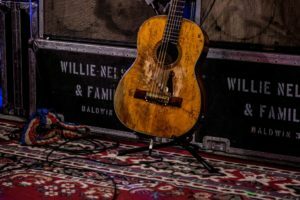 Legend has it that singer/songwriter Willie Nelson loves his tour bus so much that he prefers to sleep aboard it—parked outside his home—even when he’s not touring. True or not, the story is believable. After many thousands of nights on the road, a bunk is bound to feel more comforting than any bed. 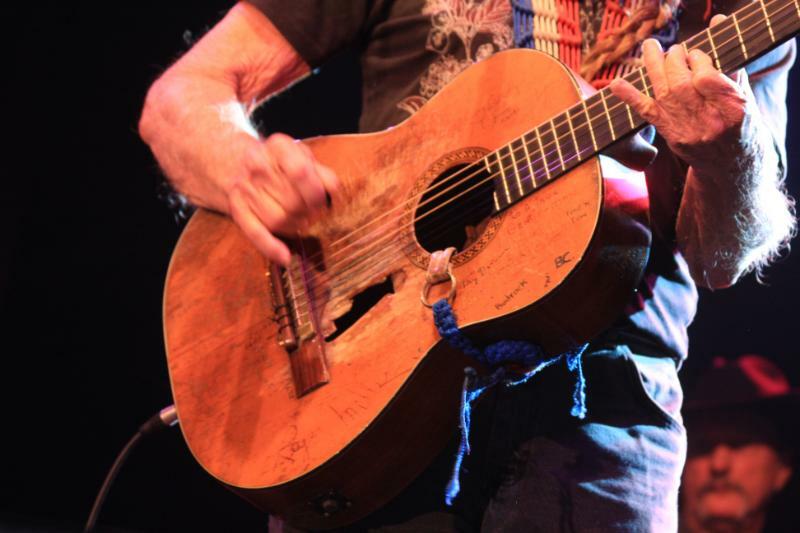 Nelson has been touring relentlessly as long as anyone can remember. 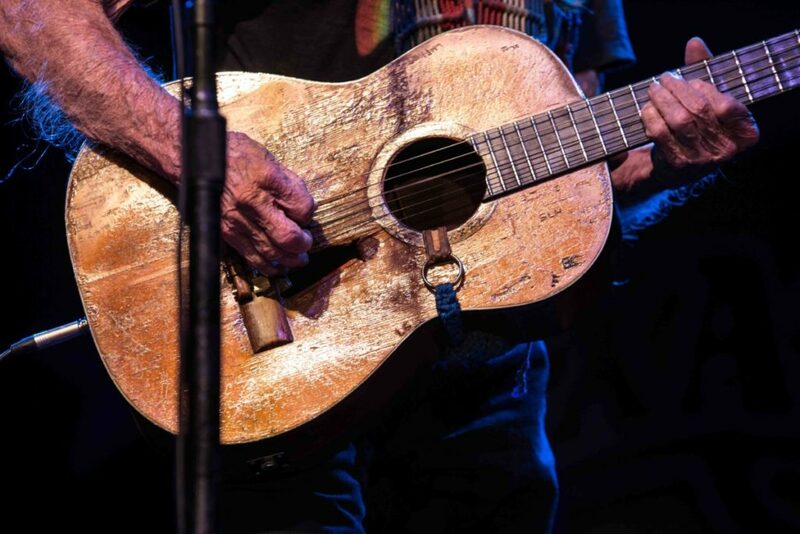 Unlike most artists, who’ll hit the road primarily to promote a new release, Nelson just keeps on keeping on, whether or not he has a new album to plug. At any given moment, however, odds are good that Nelson does have a new record out. 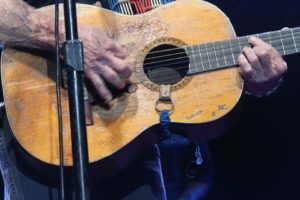 Since beginning his recording career in the early 1960s, he has released more than 70 studio albums, two dozen collaborative albums, several live recordings, and countless compilations. His latest studio effort, Last Man Standing, was released on April 27, 2018—two days before his 85th birthday. 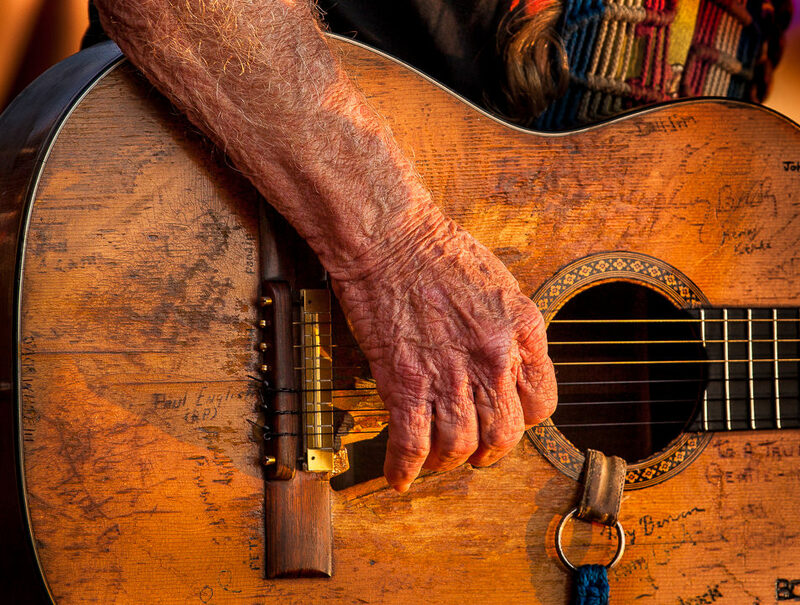 Many of Nelson’s original songs are now classics of the country canon—including “Crazy,” “Bloody Mary Morning,” “On the Road Again,” “Funny How Time Slips Away,” “Night Life,” and “Three Days.” Despite his popularity as an artist, he was a behind-the-scenes songwriter first. Consequently, the best-known versions of many Nelson songs are by other recording artists. “Crazy” is most often associated with vocalist Patsy Cline. 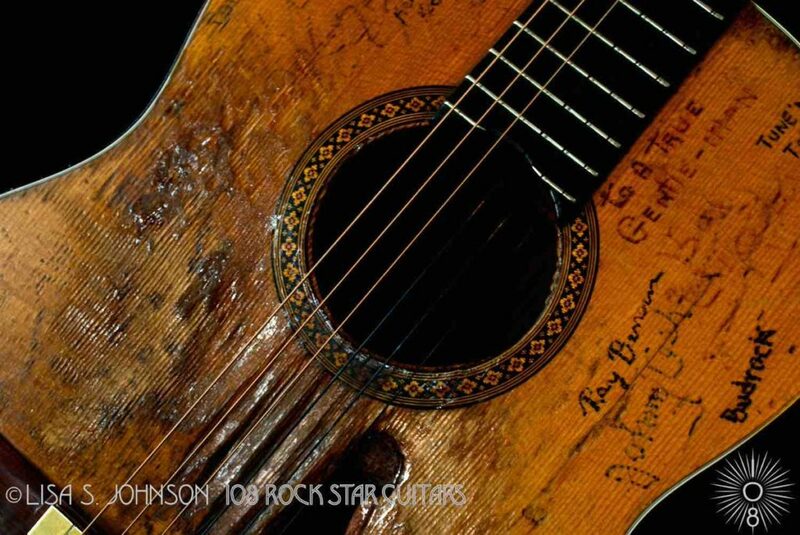 “Night Life” was a hit for Ray Price, and many blues fans are familiar with B.B. King’s version. “Three Days” was a 1962 hit for Faron Young and did well for k.d. lang in 1990. 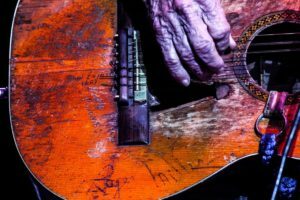 Nelson is almost never seen or heard without his well-worn nylon-string guitar, Trigger (named after film cowboy Roy Rogers’ horse), in hand. 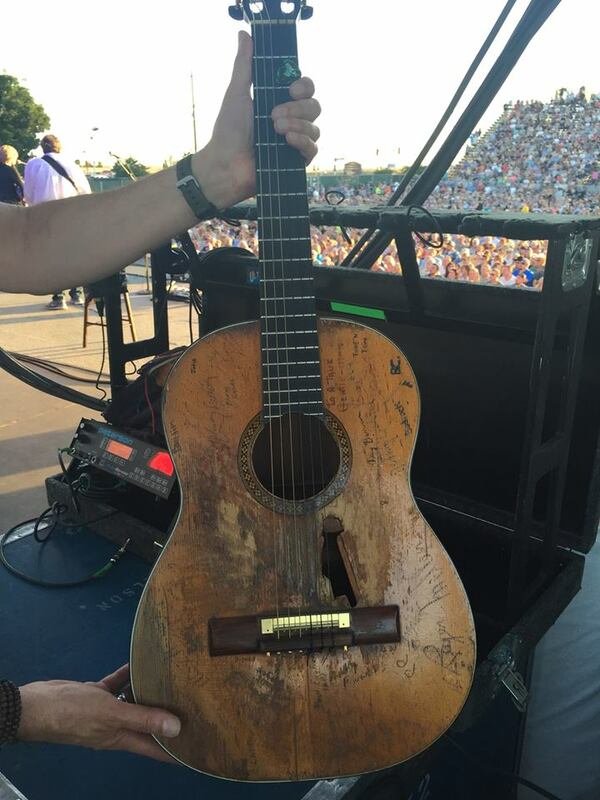 He acquired this Martin N-20 in 1969. 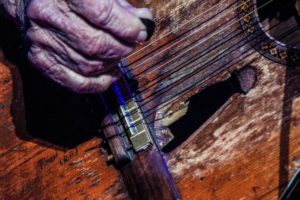 He’d previously been playing a Baldwin nylon-string model, equipped with that company’s proprietary Prismatone pickup, played through a solid-state Baldwin C1 amplifier. 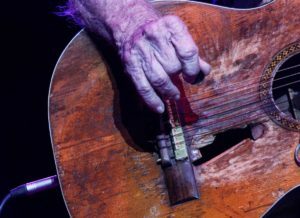 That guitar got busted up by a drunken patron’s misstep while Nelson was gigging on the outskirts of San Antonio, Texas. 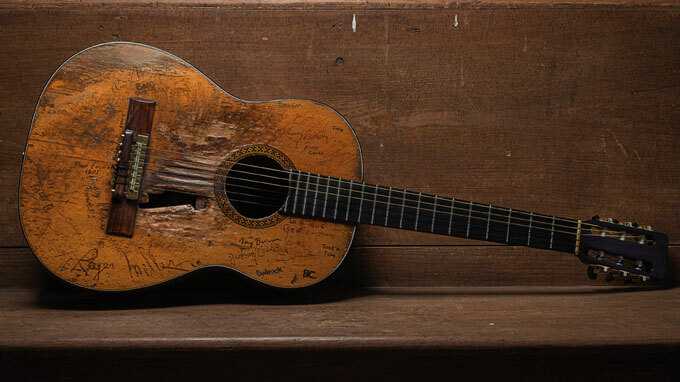 When Nelson sent the Baldwin guitar back home to Nashville to be revived, the repairman told him it was beyond hope, and mentioned that he had a new Martin for sale. 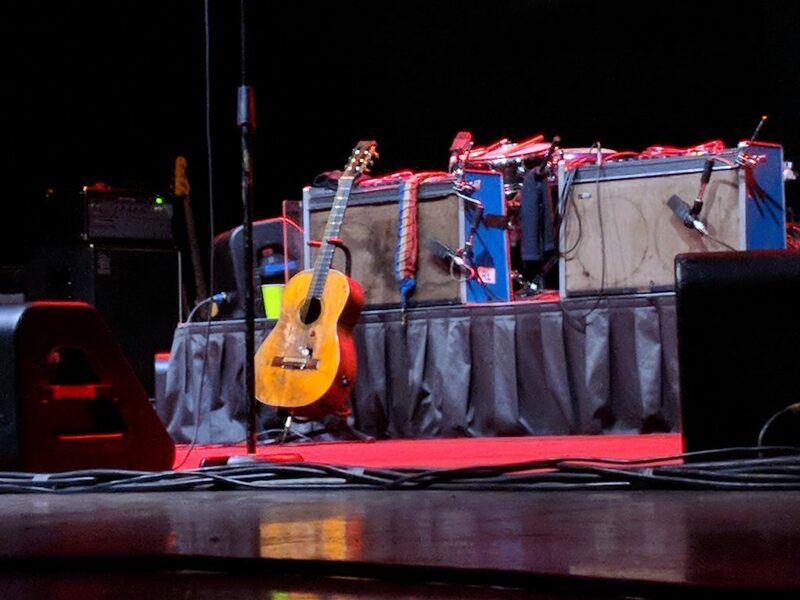 Since Nelson had liked the Baldwin’s amplified tone, he asked the repairman to pull the pickup from his totaled guitar and install it in the Martin, and Trigger was born. Nelson has been playing Trigger ever since, and the guitar and amp setup is as much a part of his musical persona as his voice is. 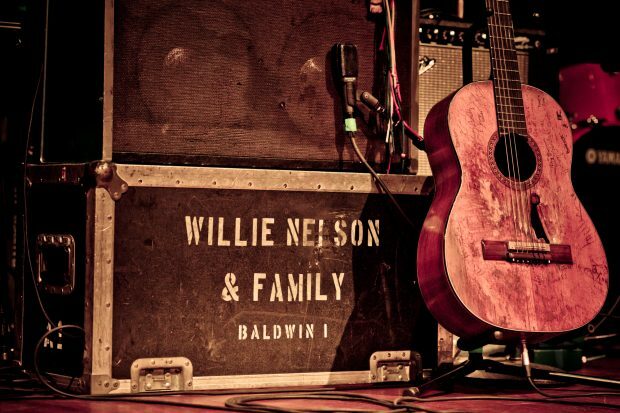 Though Nelson is most easily described as a country musician, elements of jazz have always permeated his style. This may be most apparent on his 1978 album Stardust, on which he croons his way through well-loved jazz standards, such as “Georgia on My Mind” and the album’s title track. But even on other albums, when he’s playing one of his own three- or four-chord songs, Nelson always takes melodic and harmonic chances. Country may be his milieu but jazz is his M.O. 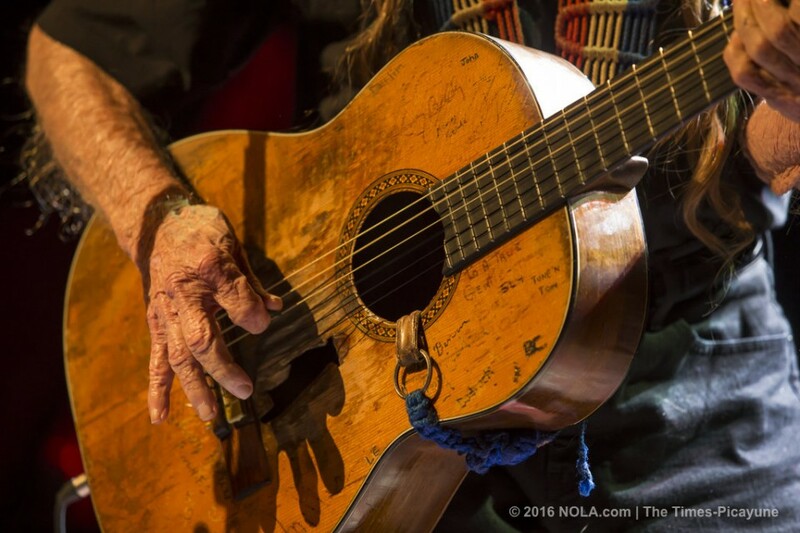 It’s no secret that Nelson’s primary inspiration—on the guitar, at least—is the late Gypsy-jazz luminary Django Reinhardt. 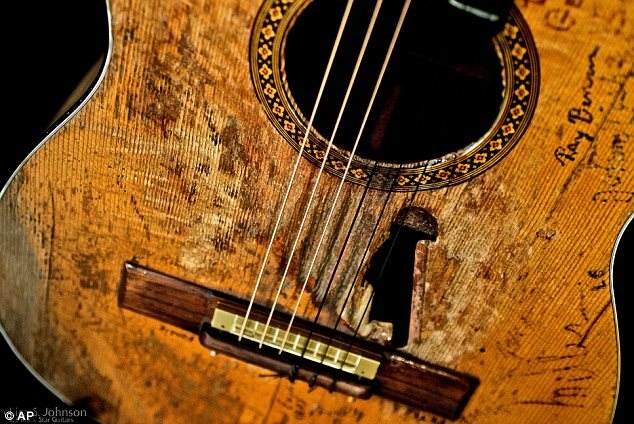 Echoes of Reinhardt’s sinuous melody lines can frequently be heard in Nelson’s guitar solos, as you’ll see later in this lesson. 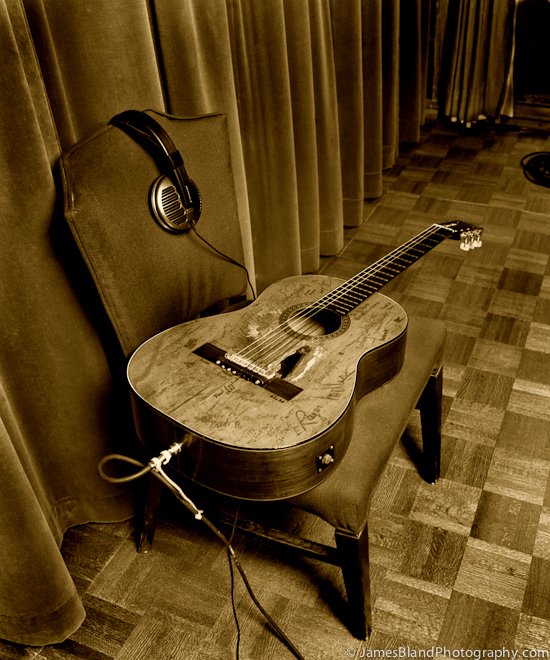 The first two examples here highlight Nelson’s notable rhythm-guitar style, which exhibits some Gypsy-jazz sophistication as well. the parallel voicing motion. Interestingly, the remainder of this passage is purely triadic. Nelson has never seemed to mind mixing jazz flavors with campfire sensibilities. 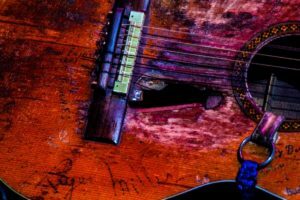 If you want to dig deep into Nelson’s guitar style, The IRS Tapes is a great place to start because it was recorded without any additional production or orchestration. It’s just his voice and guitar throughout, presumably tracked live in the studio. 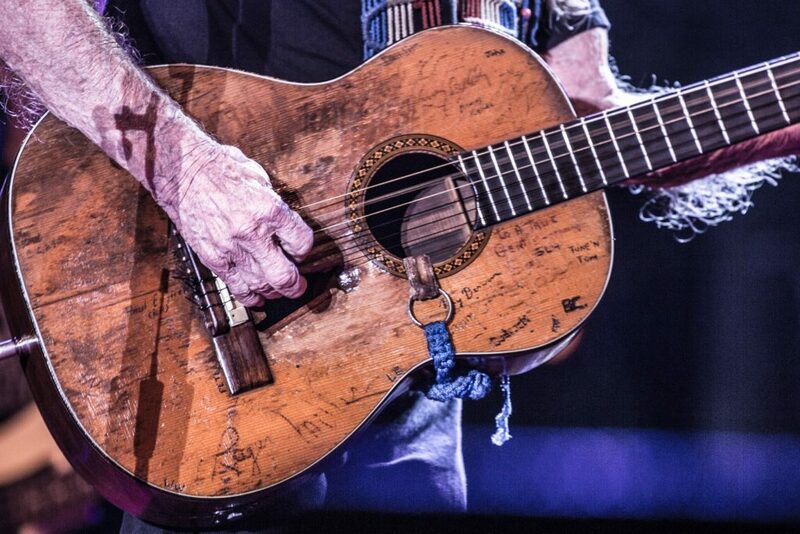 VH1 Storytellers: Johnny Cash & Willie Nelson is another great opportunity to hear Nelson’s guitar in the foreground. Recorded at a live concert appearance in 1997 (and released a year later), the album features just these two, singing some of their best-loved songs. They both play guitar, and take alternate turns on lead vocal. Example 2 is composite—inspired by Nelson’s freewheeling fills and Cash’s rock-steady rhythm on their version of “Funny How Time Slips Away” from VH1 Storytellers. The first three measures are straightforward—à la Cash—except for the Ab on beat 4 of measure 1. That’s pure Nelson. (Going to a G chord? Why not get there by half step?) Measure 4 incorporates a rootless A9 arpeggio, starting on the chord’s third (C#). Played smoothly—as Nelson would—the maneuver sounds much more complex than it is. 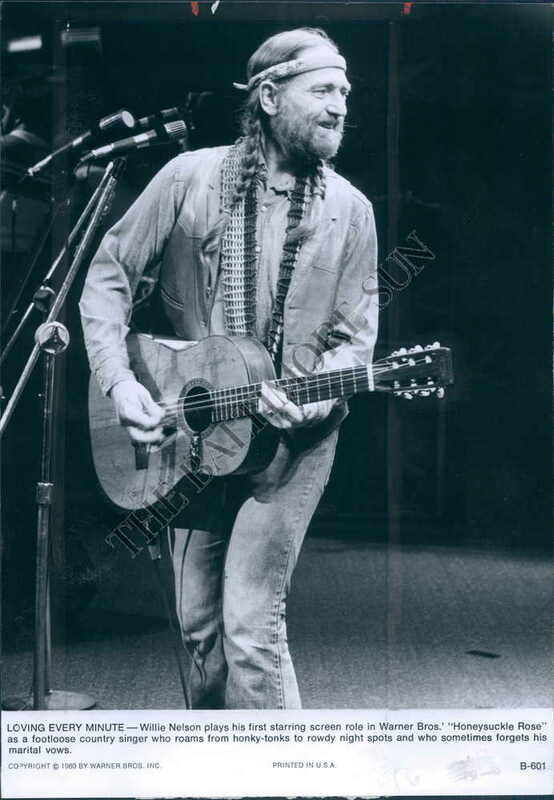 Example 3a is in the style of Nelson’s intro to “Are You Sure,” from his mid-’60s album Country Willie—His Own Songs. 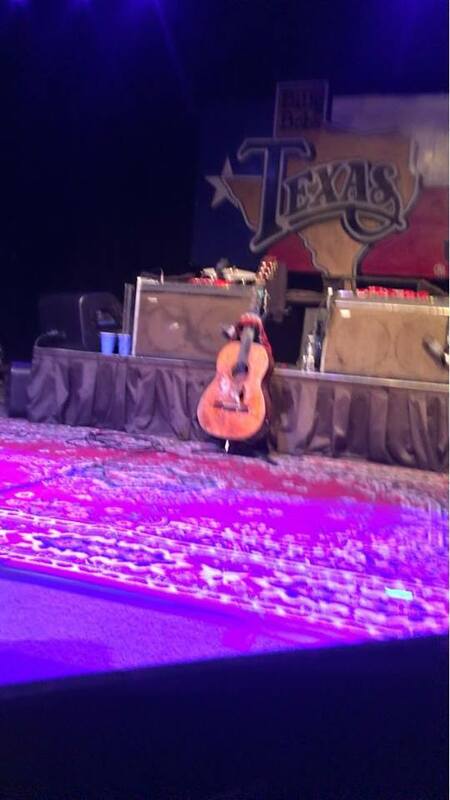 Trigger wasn’t in his hands just yet but he’d already been developing a singular voice on the guitar. This example illustrates Nelson’s uncanny ability to keep the fundamentals covered while coloring outside the lines. You can see how the new chords are outlined fairly clearly at the beginning of each measure, yet there’s some sly chromaticism to be found in between. In Example 3b—also styled after “Are You Sure”—the fills get bluer and richer, harmonically speaking. Check out the two-note shapes in measure 2 and three-note shapes in measure 5. As before, these aren’t difficult grabs, but they can sound incredibly cool when you play them with confidence. The rest of the fills here are common blues vocabulary, paced to complement Nelson’s vocal delivery. Make sure to listen to the original recording. 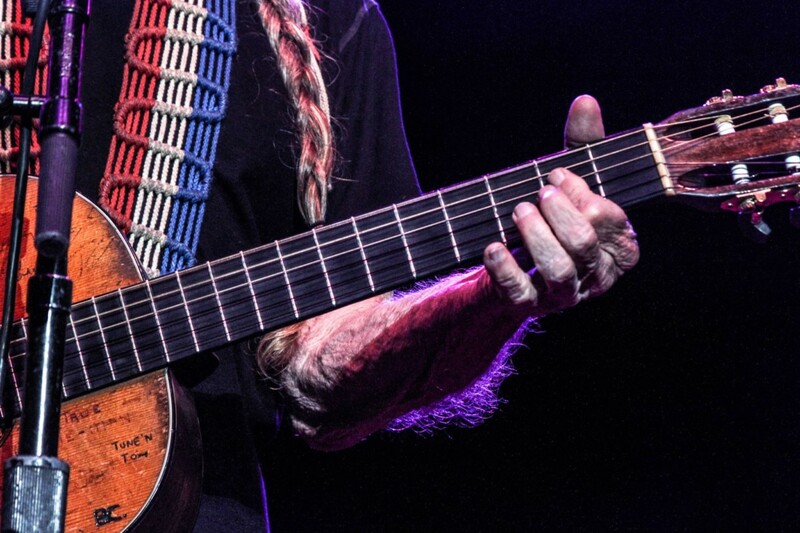 “Darkness on the Face of the Earth” is another song from Country Willie that showcases Nelson’s guitar skills. Example 4 is in the style of the song’s introduction. Guitarists don’t always think of the key of F major as one that can feature hammer-ons from open strings. This example illustrates that there are plenty of melodic possibilities. Nelson had previously recorded “Darkness on the Face of the Earth” on his 1962 debut album, And Then I Wrote, and he revisited it once again on his 1998 album Teatro. His guitar work on this later recording is completely different, though no less inventive. The next two examples are inspired by Nelson’s thrilling mid-song solo. Example 5a begins simply and spaciously, which serves to heighten the drama that follows. In measure 3, an eighth-note line climbs up the E major scale from its sixth degree (C#). This line changes direction at the end of the measure, morphing into a melodic pattern that continues downward through the first two beats of measure 4. Beats 3 and 4 here are a tumbling blur with chromatic passing tones. A few fingerings may work for this passage, but try this one first: Play the triplet with fingers 3-2-1, then quickly shift down one fret so that your second finger is on F#; finger the 16ths 2-3-2-1, then quickly shift down one more fret so that your first finger is on E for the downbeat of the following measure. 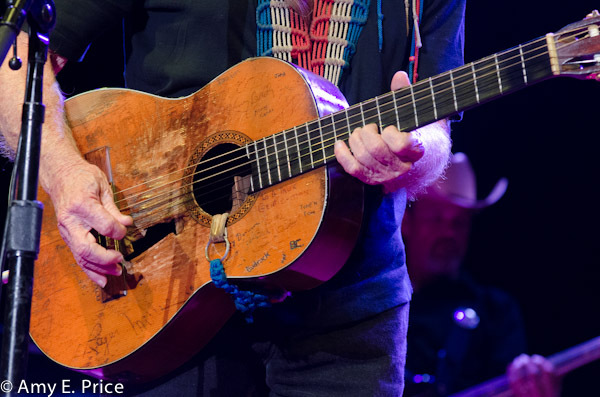 Win a copy of Willie Nelson new album “Last Man Standing” and a print of his guitar (pictured below), signed by photographer/author Lisa S. Johnson!